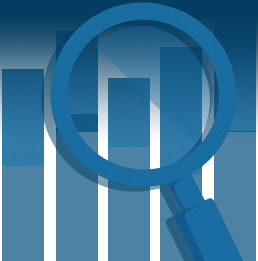 In early 2015, Capterra surveyed 500 businesses of all shapes and sizes to compare their CRM usage. Customer Relationship Management software has come a long way in the past 30 years. From enterprise contact databases and early sales force automation systems, to the emergence of cloud CRMs and surviving the dot com bubble burst, CRM technology has had a long history (at least in comparison to other software solutions). Today, with the rise of social CRMs, marketing automation solutions, Big Data, and mobile CRM apps, the industry continues to evolve and cater to new business needs of the 21st century. Because CRM software is fundamental to the growth of the software industry as a whole and one of the most ubiquitous types of business software, it's important to understand how businesses actually use this technology, and where CRMs could stand to improve in the coming years. That's why Capterra surveyed 500 CRM users to get an overview of exactly how businesses find, buy, and use their customer relationship management software . Whether you're a current CRM user, considering a CRM for your company, or a seller of CRM technology, read on to learn the latest trends from Capterra's CRM software research report. More than half of users adopted a CRM within their company's first five years in business, and 2/3 of companies had at least 100 customers when they first purchased a CRM. CRM software had the biggest impact on customer retention rates and customer satisfaction rates, according to respondents. If you have any customers, chances are that your business can benefit from CRM software. But despite its ubiquity, CRM did seem to be particularly popular in a handful of specific industries. Retail was far-and-away the most common segment of CRM users represented in our survey, at nearly twice the size of the next industry. Retailers benefit from CRM data by tracking purchase behavior over time, suggesting related products for upselling opportunities, and logging loyalty points in customers' accounts to apply toward discounts and free offers. The next four most common industries using CRMs all tend to have larger, more complex purchases—whether they are catering to consumers or other businesses. It makes sense that accountants, consultants, software companies, insurance providers, equipment manufacturers, and the like would want to keep track of all of their customer interactions over time, given that it usually takes many months and many people's input to make a large purchase like those listed above. And even once someone buys one of these products or services, a CRM is still necessary to track customer communications, help requests, contracts, invoices, and subsequent purchases. 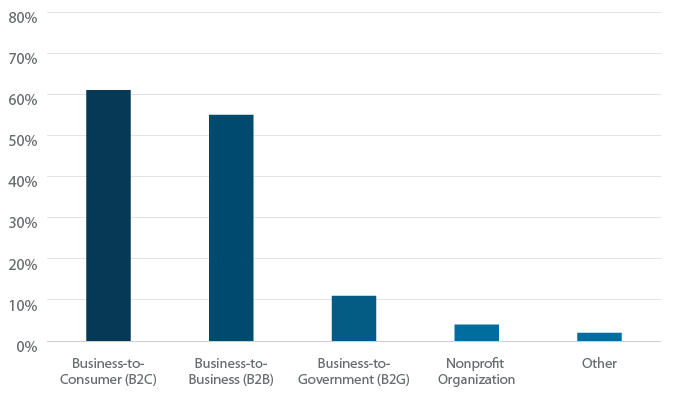 At the lower end of the spectrum, Nonprofits were the least likely to use a CRM at just 4% of respondents. The lack of CRM usage could be because nonprofits are notoriously slow to adopt new technology due to lack of funds and technological know-how. Or, it could be because they are using donor or membership management software to keep track of interactions with stakeholders, but since they don't have “customers” in the traditional sense, they don't consider the software to be a CRM. 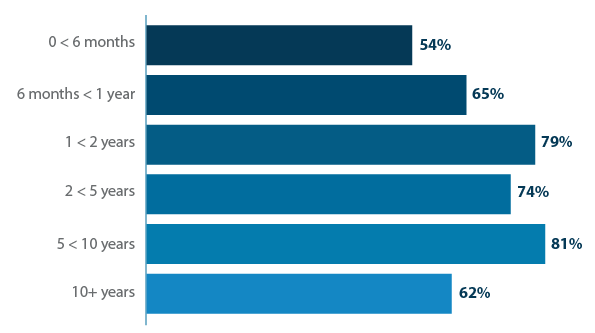 Not surprisingly, because CRMs are often among the first software that businesses adopt, organizations of all revenue sizes were represented in the survey. 52% of respondents worked at organizations with less than $10 million in annual revenue, showing that it's no longer just “enterprise” companies that invest in CRM. With a slew of small business CRMs now available, SMBs are among the fastest growing segment of CRM users. 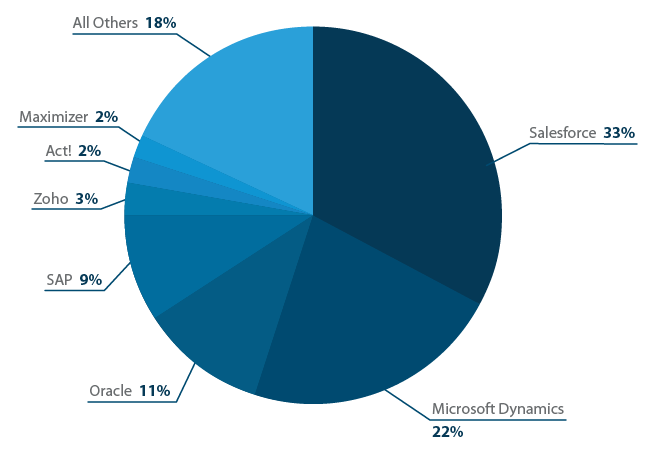 Which departments use CRM software? Don't let the name “customer relationship management” fool you. 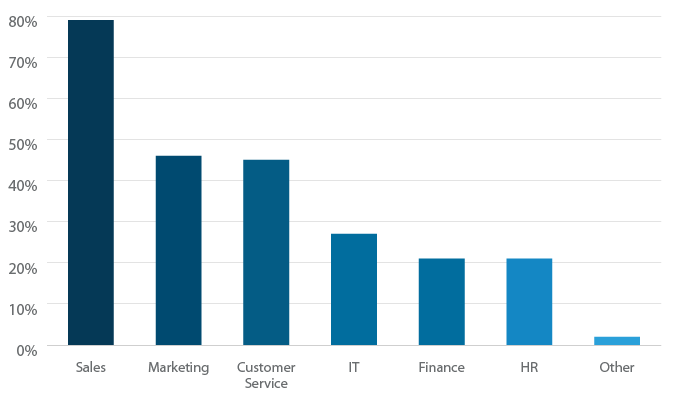 The customer service team was only third in the list of departments that most often use a CRM. So if not customer service reps, who actually uses a CRM? Nearly 80% of CRM users said their sales team has access to the system, which is no surprise since much of the value of a CRM comes from the ability to track prospects leading up to a sale. Similarly, the marketing team slightly edged out customer service teams in terms of CRM usage, likely for the pipeline reporting, ROI tracking, and prospect data available in CRMs to better personalize marketing campaigns and measure campaign performance. Other departments, such as IT, Finance, and HR also use CRM software in about 20-25% of businesses. IT is often involved in CRM implementations, updates (in the case of installed CRM software), and integrations with other systems. Finance typically needs access to customer billing records and contracts, which can be stored in your CRM, as well as forecasting data based on current sales trends reported in the CRM. HR professionals may use CRM notes and call data to track employee performance and productivity of other departments, such as sales and customer service, or they may use the company's CRM to keep track of job applicants and candidates instead of implementing a different system specifically for recruiting. How long after being founded did your company first start using CRM software? According to our research, more than half of businesses adopt a CRM within the first five years of existence.More than half of businesses adopt a #CRM within first 5 years.Tweet This But when we accounted for the fact that 13% of businesses said they were founded before CRM software existed and 6% did not know at what point in their lifecycle they adopted the software, it skews the graph even earlier, indicating that the vast majority of businesses now adopt a CRM within the first two years after starting up. How many employees did you have when you first adopted CRM? Curious how big your business needs to be before it's worth investing in a CRM? 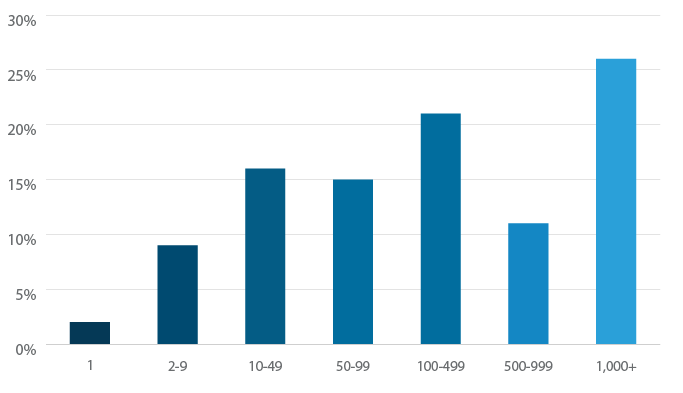 Employee count was fairly evenly distributed across our respondents as far as when they first adopted CRM software, but the sweet spot seems to be in the 2-500 employee range. Obviously, this number varies widely based on your business. If you are a two-person consulting company managing thousands of clients, then a CRM is probably worthwhile. If you and a partner operate a food truck, it's probably not time for a CRM yet. Employee count didn't seem to be a great indicator of when it's time for a CRM system. How many customers did you have when you first adopted CRM? On the contrary, two thirds of respondents had at least 100 customers when they first adopted a CRM2/3 of #CRM users had at least 100 customers when they first adopted CRM.Tweet This, and more than a quarter had over 1,000 customers when they first adopted CRM. Once customer count starts to grow to the hundreds, it makes sense that companies would need a more centralized way of keeping track of accounts and communications. So rather than basing the need for CRM off of revenue, employee count, or how old your business is, the number of customers being over 100 is the best indicator of whether you're ready or not. How many administrative users have access to your CRM? However, even though employee count isn't necessarily the best indicator of when you'll need a CRM, most CRM pricing models are based off of how many users will need access to the system. Also, the more administrative users you'll have at the outset, the more difficult it will be for everyone to be trained and involved in the implementation. On the other hand, with more people familiarizing themselves with the system from its inception, you'll have less risk if any one of your CRM administrators leaves the company. 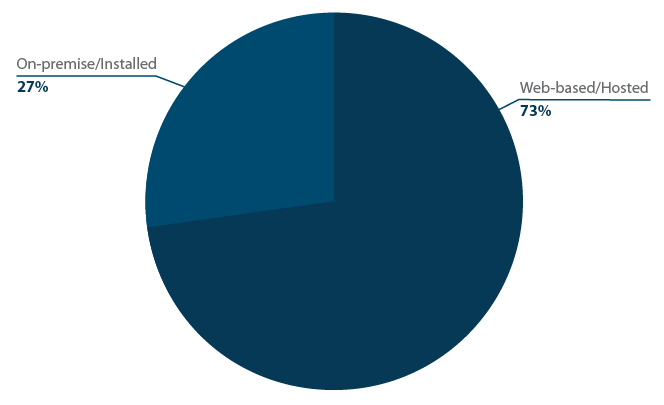 60% of our respondents had less than ten administrators of their CRM. Keep in mind that sales managers and administrators aren't the only people who will need access to your CRM. Most likely, all of your sales representatives and many of your customer service reps (if you have them), will also need access. 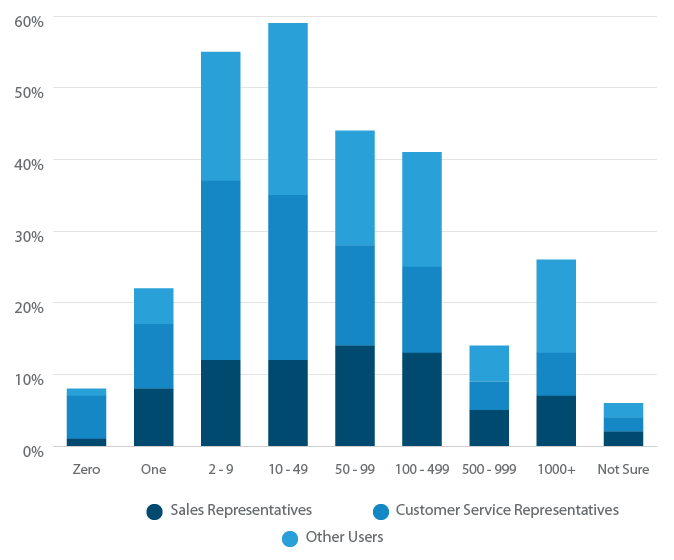 We asked respondents how many of each type of user had access to their CRM, and the percentage of each answer is represented in the graph below. 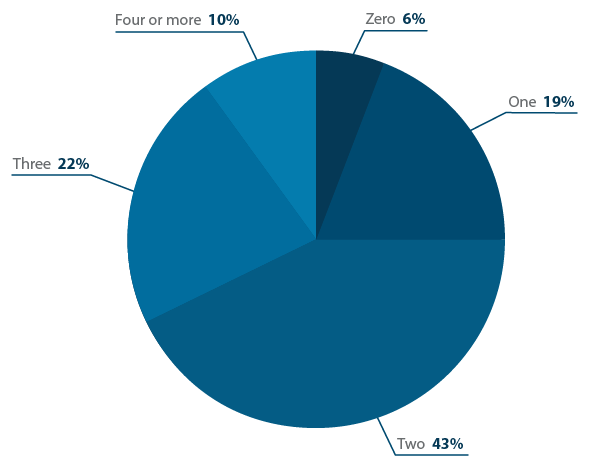 About 40% of respondents had a team of more than 50 sales representatives with access to the system. But most respondents had far fewer customer service reps using their CRM, with about a quarter saying they had 2-9 customer service reps using the system, and another quarter saying they had 10-49 customer service reps. Which CRM Do They Use? Similar to our infographic of the Top 20 Most Popular CRM Software, a few big players dominate the majority of the CRM market. Which CRM do you currently use? But Zoho, Act!, and Maximizer, which all cater to slightly smaller businesses, have cut into that market share in recent years. Since Capterra first released its Top 20 Most Popular CRM ranking in 2013, Maximizer has jumped above Oracle, and Zoho has surpassed both SAP and Act! to capture the #2 status in terms of overall popularity. Still, when we broke out the survey responses to see which CRMs were most common among respondents with less than $5 million in annual revenue compared to those with more than $50 million in annual revenue, they remained the same: Salesforce, Microsoft Dynamics, and Oracle (respectively). How Do Buyers Select a CRM? Picking a CRM is no easy feat, with more than 350 CRM options available today. There's everything from big CRM vendors like Oracle and Salesforce, which cater to all sorts of businesses and industries, to very niche CRMs like Construction CRM software or Real Estate Agency CRMs. Following these insights from previous CRM buyers can help shed even more light on the process and help you decide which CRM is best for your business. Were you using a different CRM before purchasing your current software? 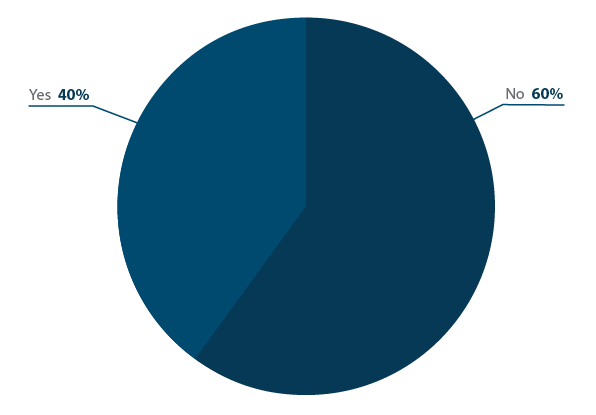 60% of the CRM users we polled were still using the first CRM their business purchased. But another 40% had switched from a previous system. This data suggests that while overall the demand for CRM systems continues to grow, users may reach a point at which they “outgrow” their CRM or become unsatisfied and decide to switch. Of the 40% of CRM users who switched from a previous system, the most common reason was that their CRM was lacking critical functionality40% switched to a new #CRM because of lacking functionality.Tweet This. Which functionality? 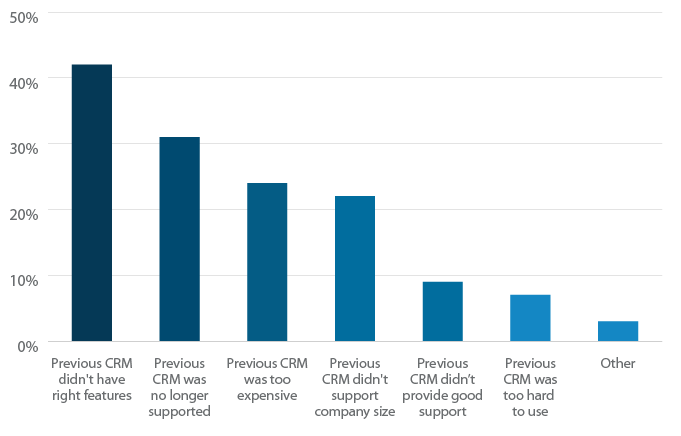 See “How Do Businesses Use Their CRM?” below for the specific features buyers felt were lacking most. Additionally, nearly a third of second generation CRM users said that they switched because their previous CRM was no longer supported. That's a far higher percentage than other types of software users we polled. The CRM industry has had its fair share of acquisitions and mergers, not to mention that many CRM vendors went out of business in the early 2000s when the dot-com bubble burst. The industry's long history compared to other, greener types of software may account for why a large number of users have been forced to switch. The third most common reason for switching is that the previous CRM became too expensive. This price sensitivity makes sense since CRM pricing increases as the number of users grows. Once a business gets to a certain number of sales, marketing, and customer service reps, it may make sense to re-evaluate their CRM and see if they can get a lower cost-per-user with another system that's better catered to their size. What first prompted your need for a CRM? Respondents first started to recognize their need for a CRM solution when keeping track of customers, sales revenue, and key metrics started to get out of hand. It's not unusual for businesses without a CRM to use Excel spreadsheets, rolodexes of business cards, or a list of email addresses to keep track of their customers. By upgrading to CRM software, not only can you centralize your database of customer information, but in doing so, you can also track sales revenue and key business performance metrics in a far simpler way than with Excel or lists. 57% of buyers indicated these two needs were the tipping points for when they first considered a CRM, so if you're spending countless hours aggregating customer data each month and it takes hours upon hours to calculate your sales, it may be time for a CRM. How many options did you demo before making your final decision? Once they'd made the decision to buy a CRM, three quarters of respondents did demonstrations of at least two solutions to compare their options. Shockingly, the other 25% of respondents either did no demos of CRM software before making a decision, or they decided to purchase the first CRM they demoed without looking at any alternatives. Compared to other types of business software purchasers, CRM buyers tended to do fewer demos. With such a wide range of price points for CRM, it's no surprise that most respondents either over- or under-shot their budget. 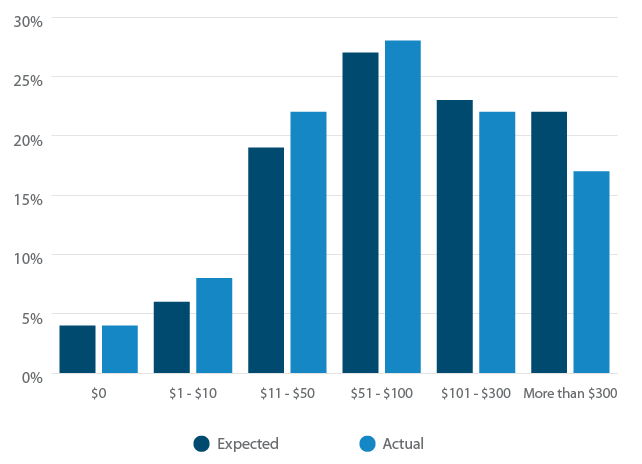 For solutions under $100/user/month, respondents expected to pay less than they actually did. However, when businesses budgeted over $100/user/month, they were surprised by the economies of scale and actually paid less than they had expected. On average, companies reported spending approximately $150/user/month on their CRM. Despite miscalculating their CRM costs, CRM users tended to be less concerned with price, as only 14% of respondents said it was the most important factor in their decision. Functionality was by far the most important factor when selecting a CRM, closely followed by the perceived “ease of use” of the system. With so many parties involved and actively using the CRM each day, it makes sense that companies would value that the software works as they need it to and in an intuitive way. While there are horror stories of CRM implementations taking years until the software is fully operational, 80% of respondents said they were fully up and running on their CRM within 18 months or less. 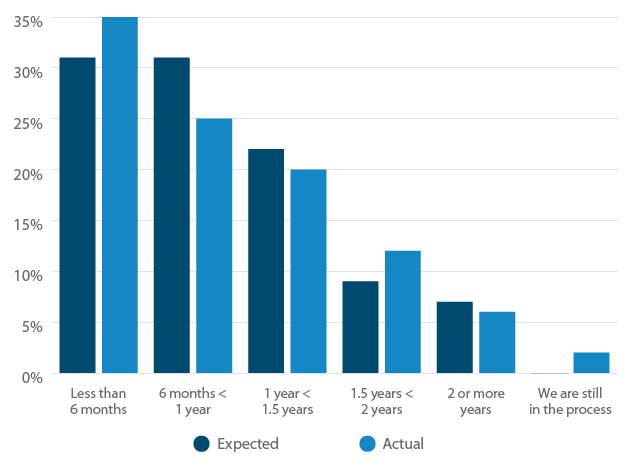 And in most cases, CRM implementations took less time than buyers expected. How Do Businesses Use Their CRM? From measuring sales pipelines to tracking customer lifetime value, and even monitoring team productivity, there are countless ways to use the data in a typical CRM. We asked users how long they'd been using their CRM, as well as their favorite features (and most lacking features) to get a sense of how CRM use changes over time. How long have you been using your current CRM? 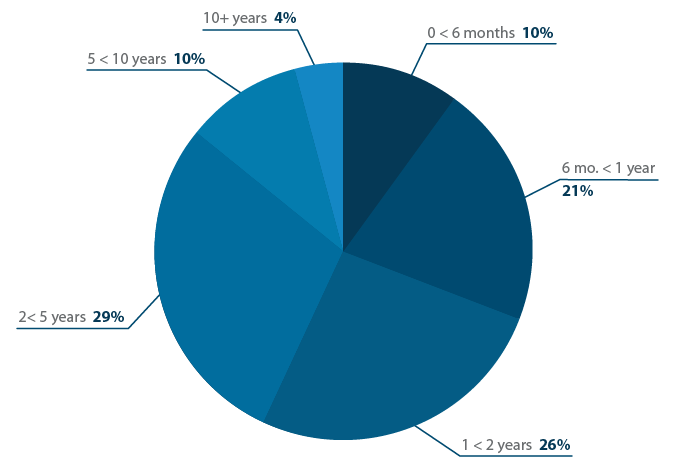 Two thirds of our survey respondents had been using their CRM for more than a year. 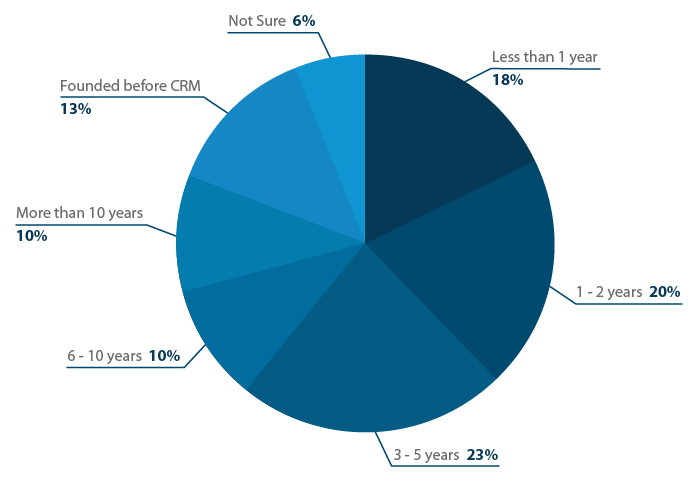 On average, most respondents had used their CRM for about 2-5 years. With just 4% of respondents saying they had used their current CRM for 10+ years, it shows that spending decades on the same platform is becoming less and less common as new CRM entrants emerge and enterprise IT infrastructure evolves. 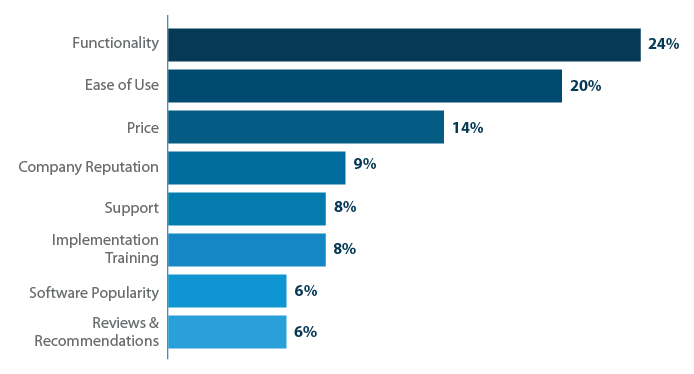 When asked which features respondents used most, calendar management and email marketing functionality topped the list. Interestingly, 44% of respondents also said they had integrated their CRM with a marketing automation solution.44% of #CRM users have integrated with a #MarketingAutomation solution.Tweet This According to recent research Capterra conducted on Marketing Technology usage, only 14% of marketers had adopted a marketing automation solution as of early 2015. This data shows that CRM users tend to be more sophisticated in their use of other sales and marketing technology than non-CRM users. The CRM system serves as a stepping stone into other software platforms that can plug-in and integrate with the CRM data. Overall, users wished their CRMs provided more social media functionality, with 25% of respondents indicating they wanted social media monitoring capabilities, and 24% saying they wished their CRM could pull in prospect information from social media profiles. While some social media data is private and unable to be accessed by CRM data feeds, many CRMs do append data, pictures, and links to prospects' social media profiles based on their email address. Increasingly, more and more CRM solutions are branding themselves as a “Social CRM” to better differentiate their social media functionality from that of traditional CRM solutions. When split out by B2B vs. B2C users, the desired CRM functionality remained the same. However, B2B users were slightly more likely to want customer loyalty tracking to keep track of longer-term relationships with customers, while B2C users were more likely to want a mobile app for their CRM. How Effective is a CRM? All-in-all, people seem to be happy with their customer relationship management systems. 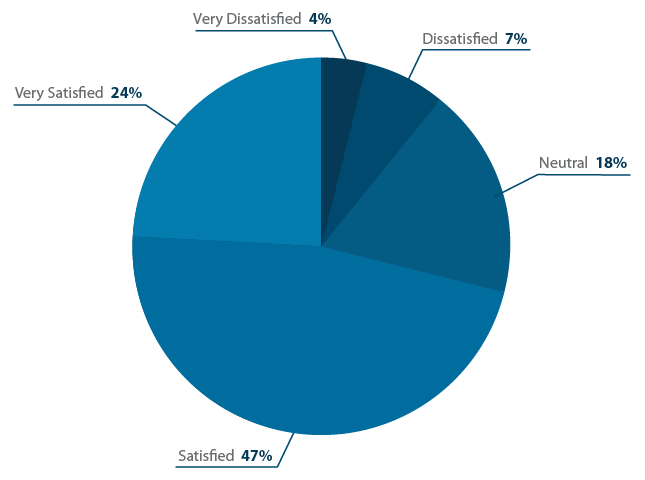 How satisfied are you with your CRM? A remarkable 71% of users said they were satisfied or very satisfied with their CRM, while only 11% said they were dissatisfied. 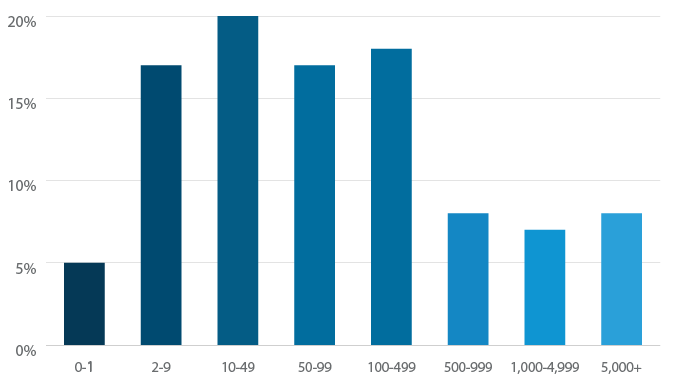 With generally high satisfaction rates and such widespread adoption, this data shows how important it is for customers (and CRM vendors) to get their CRM pick right the first time. If users only demo a couple options, and then are mostly happy with the solution they pick, they get “locked in” to the initial CRM they select. Implementations and switching CRMs can be a daunting process, so unless more users become very dissatisfied, it is unlikely there will be much movement within the industry. The change and growth comes mostly from new businesses adopting new technologies. Of the small percentage of unsatisfied users, the most common reason for being unsatisfied was that the CRM lacked necessary features. 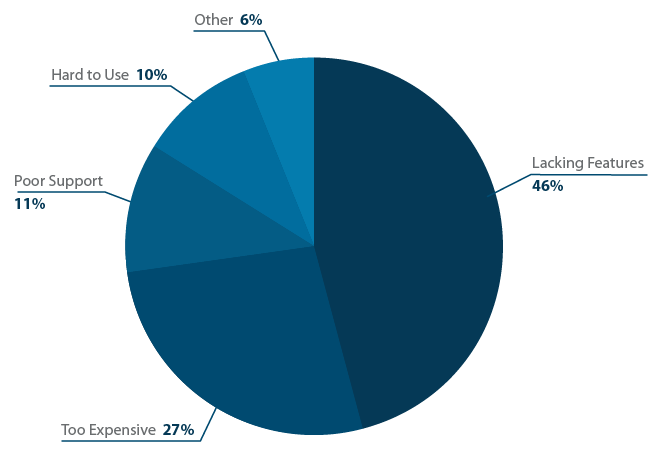 Another 27% of unsatisfied users said it was because they felt their CRM was too expensive. Interestingly, users tended to grow more satisfied with their CRMs the longer they used them. After ten years, satisfaction rates did drop, but up until then, there was a mostly steady increase in satisfaction rate, save for a slight dip in the 2-5 year range. Perhaps this is because as users grow more savvy and sophisticated with their use of the CRM, they get more out of it, or perhaps it's because the more entrenched your business becomes in a CRM, the more comfortable users become with the technology. 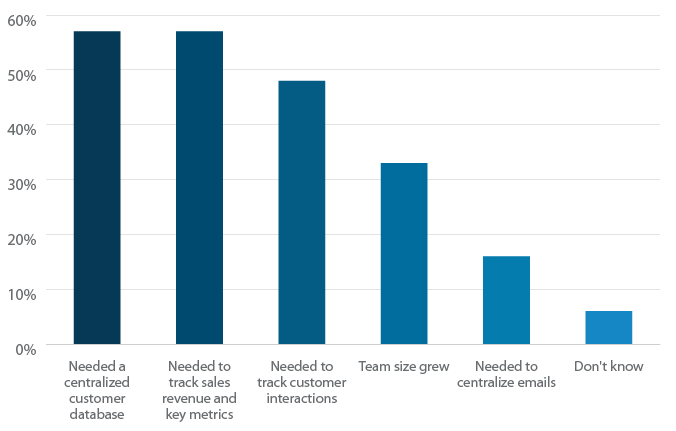 Which business goals did your CRM significantly impact? CRM is supposed to help you track the ROI of your sales and marketing efforts, but how did businesses feel about the ROI of their CRM investment? Nearly half of respondents said that their CRM has significantly improved their customer retention rates and customer satisfaction rates.47% say their #CRM has significantly improved customer retention and satisfaction.Tweet This Similarly, revenue was up for 45% of respondents after implementing a CRM, and 39% said the software helped lead to significantly more upselling and cross-selling opportunities. Current CRM vendors will upsell their users on add-ons and plug-ins to make better use of their CRM database, such as help desk software for customer service teams or marketing automation systems for marketers. With such a long history of growth and innovation for the past several decades, we look forward to seeing how the CRM industry will take business software into the future. Capterra collected the data in this CRM software report through a 31-question online survey to current customer relationship management system users in the United States, conducted over the course of three weeks and receiving a total of 500 qualified responses. Katie is the Director of Marketing at Capterra - a free online marketplace that helps businesses find the right software. Her work has been published in VentureBeat, MarketingProfs, CustomerThink, and the Demand Gen Report, and she has been featured in CIO, AdAge, and Website Magazine. Katie has a love of all things marketing, but she is particularly fond of social media, CRM, and marketing automation.